There’s a buzz in the market considering the latest launch of this NFO of Aditya Birla Sun Life MF. Know all about the same! If you are an active investor, you might have come across some of the thematic and catchy mutual fund advertisements declaring the New Fund Offer (NFO) for their newly proposed schemes. It is a conventional practice imitated by all the mutual fund companies to launch the NFOs as the equity market heads upward. 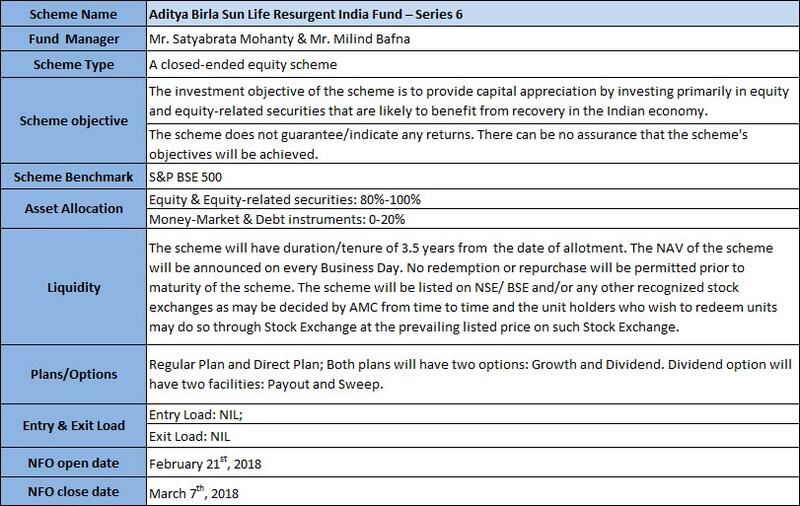 Recently, Aditya Birla Sun Life Mutual Fund (ABSL Mutual Fund) has released an NFO for its new scheme under the name of Aditya Birla Sun Life Resurgent India Fund Series 6. Before moving on to the details of this new NFO, let us first understand what NFO is? NFO is a first time subscription offered by an Asset Management Company (AMC) for its brand-new scheme. NFO is often confused with Initial Public Offering (IPO) of a share and impels the investors to presume they are investing at cheaper NAV. The initial buying offer for a new fund varies as per the structuring of the fund. NFOs can be open-ended or closed-ended for different segments like debt, equity, fixed maturity, and hybrid funds. NFOs are launched to raise capital from the investors in order to buy securities like shares or government bonds. As a matter of fact, they are meant to pool in money in a fund house to complete its product basket or to fulfill the demand from the investors for a particular theme. Open-end funds have no purchase time restriction as that in closed-end funds, which can be purchased only during the offer period. With the tagline- ‘Ek “Ujjawal Bharat” Ki Disha Mein’ Aditya Birla Sun Life MF invites the public to invest in its new MF scheme. As the NFO opens up on February 21st, 2018, the ABSL Mutual Fund makes a pitch to its investors to ‘Invest in the resurgence of India’s soul through - ABSL Resurgent India Fund Series 6’. ABSL AMC has analyzed that the companies operating in the areas related to the development of a specific part of the economy has experienced long-term benefits. Acting in accordance with the Indian government’s objective, ABSL Mutual Fund has launched a new thematic fund targeting the companies contributing in its rural transformation mission. The fund house anticipates strong market returns from the related industries in the long run. The fourth largest fund house in the country has justified its prominence by managing the AUM in an intellectual way. Aditya Birla Sun Life MF has always tried to zoom in the areas that offer favorable government policy and industry growth. Be it infra development, consumption, or manufacturing, the themes were consistent all through. ABSL Banking & Financial Services Fund, an open-end sectoral fund, became the best in the pack by generating 30% p.a. against the Nifty benchmark, since its inception. Similarly, ABSL Manufacturing Fund has delivered 12% p.a. against the S&P BSE 500’s 9.4% p.a. The fund house has also taken a call on the small & midcap players in the Resurgent India series and GST theme in the Emerging Leader series. Both the close-ended series have come out with significant alpha ranging between 2%-6% p.a. With the power-packed supervision of Satyabrata Mohanty and Milind Bafna, ABSL Mutual Fund speculates the funds focusing on the Resurgent India theme to be multi-year and return generators. ABSL Resurgent India Fund Series 6 is a close-ended equity scheme, primarily investing in equity and equity-related securities to provide capital appreciation. This fund can be a suitable choice for the investors pursuing long-term capital growth by investing in the equity, expecting the perks from the economic growth of India. Targeted the most significant focus area of the government – Ujjwal Bharat. Anticipated availing benefits from the government’s investment in huge infrastructure and ambitious initiatives that will trigger a cascading effect on the related areas as well as allied sectors. Focused on the multiple bagger opportunities across the sectors such as –Agri Inputs, Auto & Ancillaries, Discretionary, Durables & Staples, and Banking & NBFCs. Strategized the portfolio to point out the rerating opportunities across the identified sectors. Proposed a multi-year theme considering the prevailing growth like higher ROE, EPS growth, Sales growth, etc., of the companies across the beneficiary sectors. Taken care of the correction in markets that have brought valuations to reasonably adequate levels. Devised a scheme with a differentiated theme to complement the current investors’ portfolios. ABSL Mutual Fund has brought in a compelling fund which highly focuses on the Government’s current mission of Rural Rejuvenation. As christened, ‘Ujjwal Bharat’ theme is likely to be the highest growth area without any ambiguity in terms of government intent. The fund house finds the theme to be in maximum concurrence with the achievement of the desired results. For more details on new NFOs like ABSL Resurgent India Fund, keep visiting MySIPonline. We will keep you updated with the similar information on NFOs and their performances.